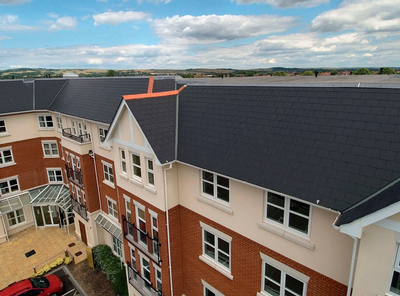 After years in the basement, the global roofing market is back on the rise, with the United States and China expected to lead the resurgence over the next five years. 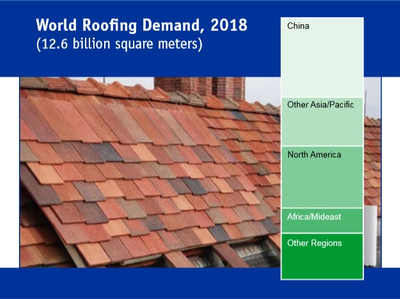 Global demand for roofing is projected to increase by 3.7 percent per year to 12.6 billion square meters in 2018—a "significant improvement from the lethargic performance" of 2008 to 2013, The Freedonia Group Inc. reports in "World Roofing." Residential and nonresidential construction are back, bringing new roofing demand with them. Gains are in store for both the residential and nonresidential sectors, the Cleveland-based market research firm reports. countries, and by continued strong growth in construction activity in lower-income areas between 2008 and 2013," Freedonia said. New nonresidential construction is expected to show the fastest growth, driven by recovering construction activity in developed countries and continued strong growth in developing areas. New residential construction, which collapsed from 2008 to 2011, continues to recover with above-average gains in roofing expected through 2018, Freedonia said. 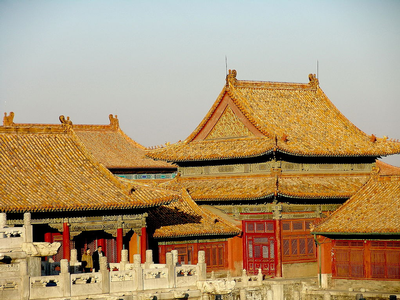 Tiled roofs have been popular in China since before the time of the Palace Museum in Beijing's Forbidden City. That popularity is expected to continue in the years ahead. Demand in residential and nonresidential reroofing is also forecast to post strong gains through 2018.
global demand in area terms. Tile products will see intensive use in the booming Asia-Pacific market, while bituminous products will continue to enjoy rapid growth in the United States, where they are popular in residential applications. Bituminous products are also beginning to gain share in the fast-growing China market. On the other hand, fiber cement products are forecast to lose market share through 2018, in part due to growing health concerns in Brazil and India about the use of asbestos. China and the U.S. together will account for more than half of global gains in roofing demand through 2018. China, the world’s largest market for roofing, will maintain strong growth and single-handedly account for more than one-third of total market gains. 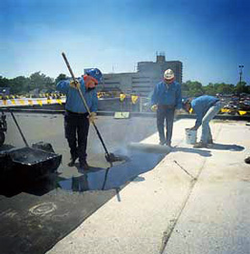 Bituminous roofing products (left) should remain popular in the U.S., but fiber cement roofing is expected to lose share. India, Indonesia, Turkey and other small roofing markets are also in line for strong growth, the report says. In the U.S., the return of the housing market will bring back the roofing market, Freedonia reports, while some other higher-income countries will also see fast, rebound-fueled growth.